This Sabbat and Esbat ritual was written by two of Coven Life’s Coven Adepts. Their names are Country Moon and Druantia Earth-song. Druantia Earth-song will be leading the gathering. Please remember that both the Northern and Southern Hemispheres Sabbats are being celebrated and the full Moon you need to stay in the circle until all the rituals are fully done. You are welcome to do both Sabbat rituals if you want to. Please DO NOT enter the chat room after 6:59 PM Central Time so the sacred circle does not get broken and have to be recast. Thank you. 1 Black candle for the God. 1 White candle for the Goddess. 1 Black candle for the spell. 2 small pieces of paper. Your favorite or a Clear Quartz Crystal – have it pre-cleansed. A fire-proof bowl or small cauldron. A good Spring of your choice or Rose or Lavender incense and incense burner for the Northern Hemisphere. A good Autumn of your choice or Cedar or Pine incense and incense burner for the Southern Hemisphere. Chalice with Egg nog, white wine or milk for the Northern hemisphere, plus offering plate with a hot cross bun and butter. Chalice with Red wine or fruit juice for the Southern Hemisphere, plus offering plate with a slice fruit bread and butter. SOUTHERN HEMISPHERE: You can decorate your altar up in Autumn color’s[Red, orange, green, black]. You might like to scatter Autumn leaves around the altar[or use Autumn evergreen branches in a vase instead. ]Situate this at the top center of your altar. The White Goddess candle is situated at the top left corner. ***Please be fire safety aware. Keep any flammable items away from the candles. It might also be a good idea to open a window to release any smoke. ADEPT DRUANTIA: Greetings all! Tonight or Today we are drawn together to celebrate three special times-the Full Moon Esbat and Ostara/Mabon sabbats. This is a powerful time, with the emphasis on death, birth, and rebirth[releasing, renewing and balance]. With our spells being brought forth on a Full Moon and Sabbats the two together will make them stronger. Before we begin, let us all introduce ourselves and state where we are from. EVERYONE: Please type your first or pagan name, state or country. Guardians of the Watchtowers of the East, Powers of Air, we humbly invite you to our circle and ask for your wisdom, guidance, and protection. Guardians of the Watchtowers of the South, Powers of Fire, we humbly invite you to our circle and ask for your wisdom, guidance, and protection. Guardians of the Watchtowers of the West, Powers of Water, we humbly invite you to our circle and ask for your wisdom, guidance, and protection. Guardians of the Watchtowers of the North, Powers of Earth, we humbly invite you to our circle and ask for your wisdom, guidance, and protection. EVERYONE: Please light the Goddess candle. We will now begin our rituals … Beginning with the Northern Hemisphere. Southern Hemisphere, please wait until you are prompted. ADEPT DRUANTIA: At this time and in this place between worlds, we are gathered here, not only in honor of the Mother but also in honor of the Goddess Ostara. Just as she heralds the end of the dark phase of the year, so too do we release the dark within. Just as she signifies the awakening of the light phase, so too do we summon new growth and renewed energy. EVERYONE: Please take one piece of paper and write down one to three things you wish to release (eg. I release all fears, I release my addiction to smoking, I release anger, I release guilt, I release depression, etc). If you have more than one thing, space them apart so that you can tear them off as you need to burn them. Once you have written it/them down, light the black candle. Spend 2 minutes concentrating on releasing the problem[s]. Then visualize it/them being attached to your body by a black cord. Individually put each problem into a bubble of white light and see a pair of scissors cutting the cord at the base to that attachment. See the balloon of light flying off into the distance with your problem inside until it completely disappears. Do this with each separate problem, and as each is being released, light the paper in the candle flame one at a time, if you have more than one. Once burning well, throw into the heatproof bowl or cauldron and leave it to burn completely. You will have three minutes to burn the piece or pieces of paper. Once you are finished type in DONE. Now we will do the Southern Hemisphere. Northern hemisphere please be patient. 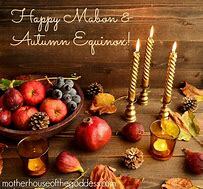 ADEPT DRUANTIA: At this time and in this place between worlds, we are gathered here, not only in honor of the Greenman but also in honor of the God Mabon. Just as he heralds the end of the light phase of the year, so too do we acknowledge the need for rest and retreat. Just as he signifies the coming of the dark phase of the year, so too do we plant seeds for positive new growth. EVERYONE: Please take up one piece of paper and write down one to three things you wish to release (eg. I release all fears, I release my addiction to smoking, I release anger, I release guilt, I release depression etc). If you have more than one thing, space them apart so that you can tear them off as you need to burn them. Once you have written it/them down, light the black candle. Spend 2 minutes concentrating on releasing the problem[s]. Visualize each individual problem being attached by a black cord. Put the problem into a bubble of white light and see a pair of scissors cutting the cord at the base of this attachment. See the balloon of light flying off into the distance, with your problem inside until it completely disappears. Do this with each separate problem and as each is being released, light the paper in the candle flame one at a time if you have more than one. Once burning well, throw into the heatproof bowl or cauldron and allow to burn completely. You have three minutes to do this. Once you are finished, type DONE. Now take up the other piece of paper and write down one thing you would like to embrace or manifest (eg. I embrace abundance and prosperity, I embrace full mind, body, spirit wellness, I embrace good luck, I embrace career success, I embrace happiness etc). Once you are done, place the paper down and pick up the crystal. Hold the crystal and concentrate on your desire. See it as it has already happened. Spend 2 minutes meditating on your desire. Dear Goddess and God, I offer you this drink as a token of my gratitude. Honor to thee Oh Old Ones!”. Then take a drink of the beverage and put the chalice back on the altar in its original place. Dear Goddess and God, I offer you this food as a token of my gratitude. Honor to thee Oh Old Ones! Then eat a bite of the food and place the plate back on the altar in its original place. Take a minute to finish your bite and then type DONE. We thank the Old Ones for the food and drink they provide for us daily. Now please visualize the God and Goddess going their separate ways, back to from whence they came. Then spend a moment releasing any energy you have retained. You can either bend down and touch the Earth or send it off to someone that is in need of healing. Either way, feel it and see it leaving your arms and going to its destination either deep in the earth to be absorbed and transformed or off to help someone. Once it has left you, stand up again.